Can you believe it’s nearly Christmas already? Christmas is one of my favourite times of the year. A mixture of decorations, lights and general festivity makes it for a nice time of the year. Don’t get me started on how hygge it feels! If you’re seeking to make your home feel more hygge, stay tuned for an upcoming post. I’ve been searching for the very best gift ideas for homeware lovers. I’ve trawled through small businesses alongside larger ones and picked out my favourites. Prices range from £4.99 to £249.99 so something will be here that will suit most budgets. Let me know in the comments below what’s your favourite! These grey metal trunks are bang on trend and perfect to store things away you don’t want to see. The trunks easily match any decor theme and look great on display. We have very kindly been sent these by Domu for review and you’ll see them in our upcoming photo shoots! If you’re searching for a gift that’s truly personal, a photo frame with a photograph is perfect. These stylish frames come in both silver and brass. I love how minimalist these frames are with the photograph taking centre stage. Anything with a personal touch gets a tick from me! 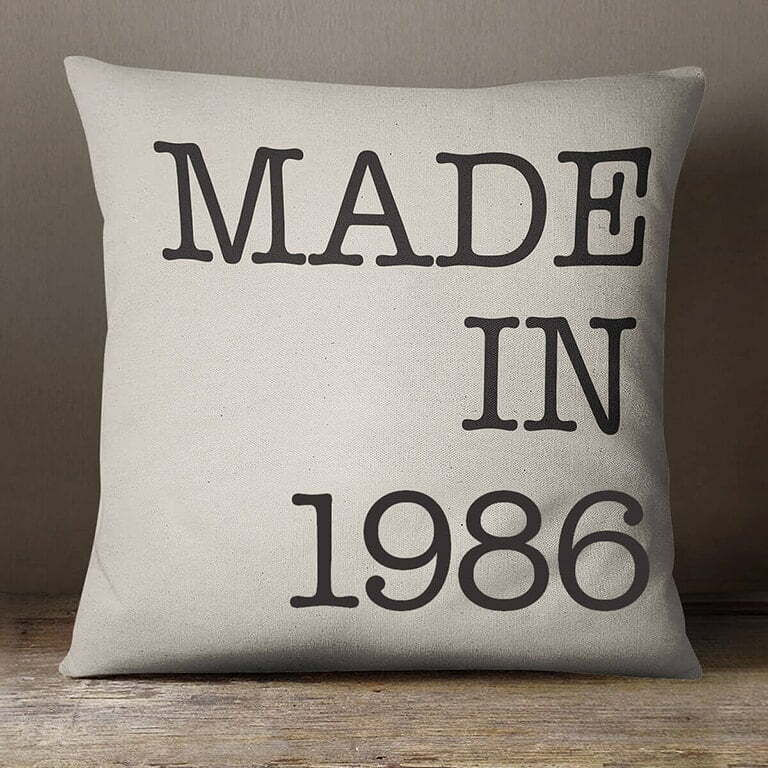 This cushion can be customised with a birth year, or you can go for the “Made in City” if you don’t want to be reminded of your DOB. They’re made from 100% cotton, so will fill perfectly soft when snuggled up to. I’m sure if you gave this as a gift to a friend or relative, it will be something they’ll have on display and treasure for years to come. Featured in my Smart Home Wishlist post, Google Home is slated to be a top gift this Christmas. Released earlier in this year in the UK, it’s been gaining popular ground in the home assistant market. With the recent release of the Google Home Mini at under £50, people are discovering the big benefits of home assistants. Sync them up with a few WiFi switches and you can automate your home! Have you got someone that loves a cocktail? They will love this! This is a beautiful matt black cocktail set by VonShef. Featuring a 550ml cocktail shaker, muddler, bar spoon/fork, hawthorne strainer, julep strainer, shot measure and recipe book which comes in a gift box. It’s made from a high-quality stainless steel with the matte black coating on the outside. We are lucky enough to have this set to review and already we love it! It’s weighty and looks extremely stylish. Laura and I are now planning a cocktail night to give these a try! This basket has a geometric-inspired design and looks great! With a hint of boho feel to it, this can suit any space. This basket can be used to store many different items, depending on what you can fit inside. I think this would look great in the lounge so you can store bits and pieces you don’t want on display. Also would be a great addition to any bathroom for hiding bottles or even some hand towels. The best part, these baskets are made by a community of female artisans in a village in Senegal, West Africa. La Basketry works directly with them, providing a fair wage and contributing a percentage of their profits to support local initiatives. If you’re seeking something personalised, this is beautiful! This artwork is a personalised star chart depicting the planets, stars and constellations at the exact moment you choose. Perhaps the day you got married to your partner or even a special day you share with a friend. Over the grey blotted background, the rose gold constellation is printed including the location and date. Rose gold and grey is definitely on trend! I saw these glasses at an industry event earlier this year and instantly fell in love! Personally, I love anything that’s geometric, so these are perfect. These glasses are stylish, unique and make a great gift. Why not even treat yourself to a pack too? You can surprise your guests over the Christmas period with delicious Christmas welcome drinks! This year it’s been all about cacti and flamingos. I’ve seen countless home accessories featuring both and I spotted this incredible neon cactus light at a recent event. Neon isn’t usually a light you’ll find in the home, but this looks stylish and will make a great gift! Less homeware and more entertainment, Google Chromecast makes a great gift! I have one of these little devices and absolutely love it. Plug this little device into the HDMI port of a TV, plug in the power cable and sync it to your WiFi. This enables you to stream YouTube videos, photos from your phone and much more direct to your TV. If you’ve got a Google Home, you can simply ask, “Okay Google, play home improvement videos on my TV” and you’ve got home improvements videos from YouTube on your TV! With access to more than 200,000 TV shows and movies, this will be a gift that will be enjoyed constantly. For wine connoisseurs, these wine glasses are a perfect gift. These glasses look highly sophisticated with an elegant shape. Also, these glasses have won many design awards, you can’t say that for many wine glasses! Okay, I know what you’re thinking, this is VERY different! But don’t fret, this is a great little gift. I wouldn’t say no to one myself! This little robot will save hours of chores! The Braava Jet is an automated floor cleaner which mops and sweeps small places, making it ideal for the bathroom or kitchen. It can squeeze into tight spaces, carefully cleans around objects, avoids stairs and rugs and is so simple to use. I own a robotic vacuum cleaner which is used every day and love it. I definitely want one of these now! Do you know a plant lover? This will be the perfect gift! These zinc and glass planters are stylish, modern and will look great on a windowsill. They’re handmade by skilled artisans and not only can be used as planters but for storing little things such as jewellery, pens or even candles.